Steak Bites are a fun twist on a traditional steak. 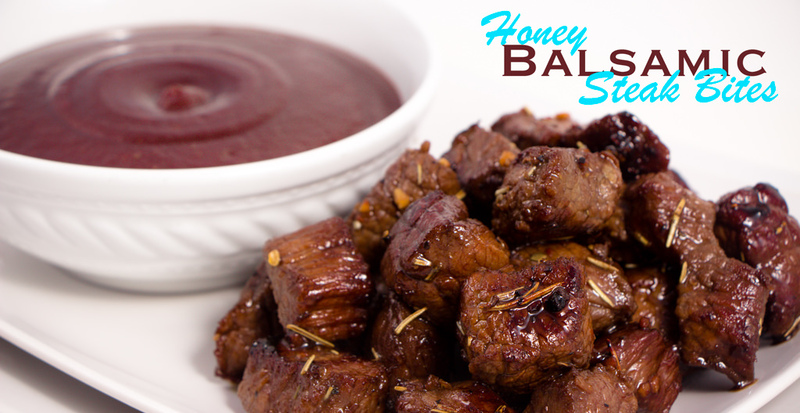 Honey Balsamic Steak Bites won’t disappoint on flavors either. These are fun as an appetizer or served as an entree with your favorite dipping sauces. There are so many sauce options, they really are endless. 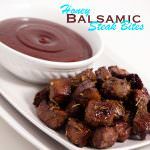 With Honey Balsamic Steak Bites you will enjoy the sweetness from the honey and the little bite from the Balsamic vinegar. Together they are perfect that will surely be devoured. 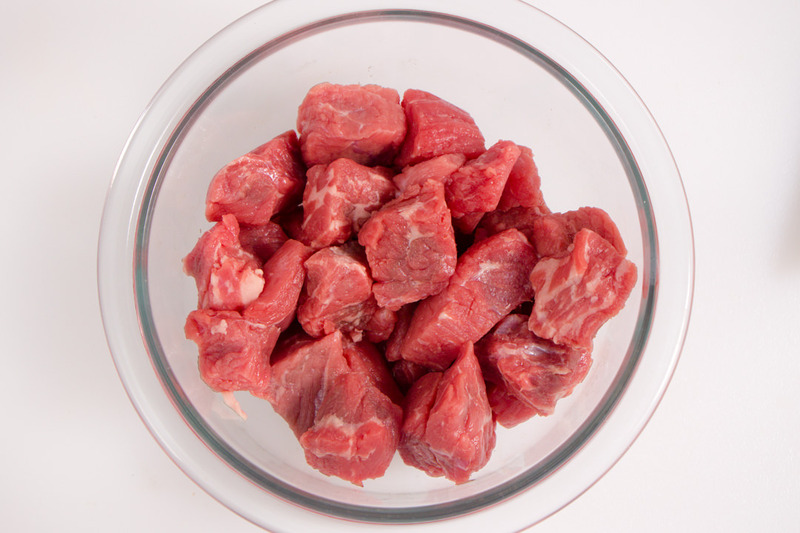 Take your steaks and cut them up in 1 in cubes. In a gallon ziplock bag add all your spices and vinegar. Mix to combine. 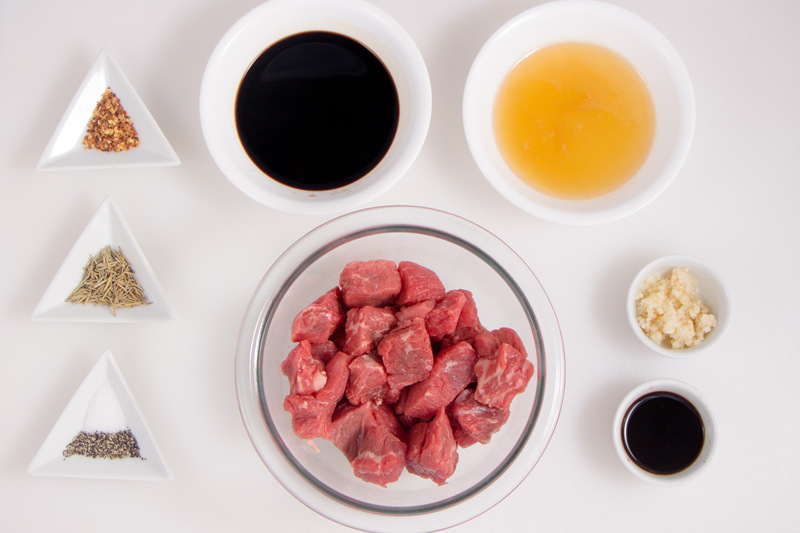 Place your cubed steak into the ziplock bag and shake to coat all pieces of steak. Allow to marinate for at least 1 hour. The longer the better, but even an hour is great. Over medium to high heat, heat up a frying pan or cast iron pan with 2 Tbls of Olive Oil. Allow the oil to get hot. 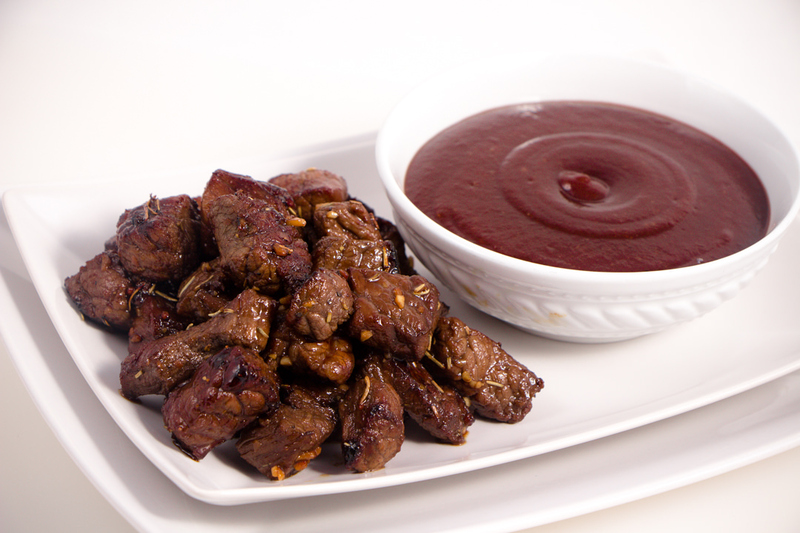 Remove cubed steak from marinade and place in hot pan to cook. Cook each side for about 1 to 1 1/2 minutes and then flip over using tongs or a fork and cook for 1 – 1 1/2 minutes on the other side. This will be perfect for a medium/well steak bites. If you like a more rare steak bite you will need to cook for less time on each side. Adjust the time according to your own preference. 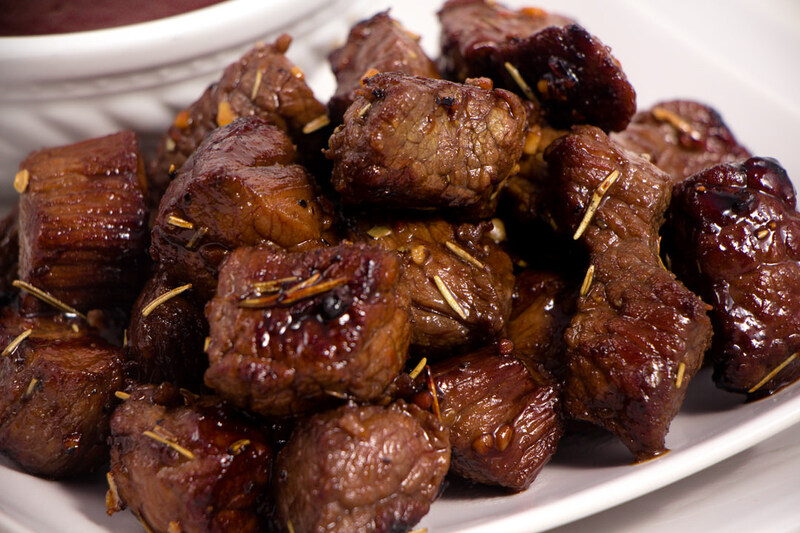 Honey Balsamic Steak Bites will come off the heat perfect and ready to eat. They are infused with honey and balsamic vinegar and absolutely delicious. Use your favorite dipping sauce and enjoy these little babies. Serve with a salad, baked potato, rice or veggies. This will be a recipe you come back for for sure. Sweet and deliciously flavorful steak bites. Serve as an appetizer or main dish. Mouth watering delicious recipe from Devour Dinner. In a separate bowl combine Balsamic Vinegar, Honey, Soy Sauce, Vegetable Oil, Garlic, Rosemary, Salt, Pepper and Red Pepper Flakes and whisk to combine. 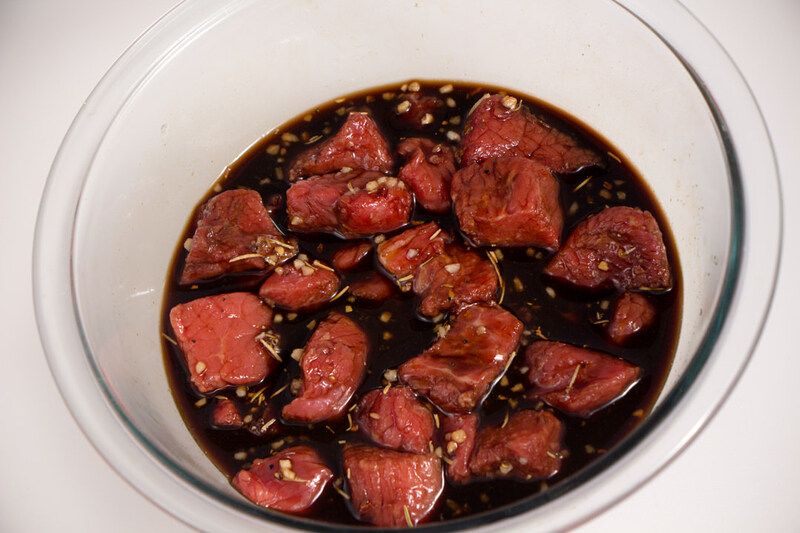 Add cube steak to marinade and place in the refrigerator for 1 - 2 hours. Add steak cubes to hot pan and allow to cook for 1 - 1 1/2 minutes per side and then flip with tongs or a fork. Cook on other side for an addition 1 - 1 1/2 minutes for a medium/well steak cube. If you prefer your steak more rare cook less time. *The sugar in the honey will cause the steak to brown quickly, so keep an eye on them. Keep heat to a medium/high temp for best results. Or put in the oven at 350 degrees for a couple minutes to finish cooking to desired temperatures. My wife invited me to make dinner… I had some steaks getting old in the freezer and couldn’t decide what to do with them… then I looked up and found this recipe. Made these over rice and a garden salad and it was a total hit!!! Thanks. Hey Matt! That’s so great to hear! This is a fun recipe. You might also like the Honey Lime Steak Bites too! This looks absolutely delicious! I cannot wait to try this! Delicious steak bite! Easy to make too, I will do skewer in barbeque too with this recipe! Goodness gracious! This recipe looks mouth-watering! I can’t wait to try this on my husband and kids who all LOVE steak! Thank you for sharing!!! This looks so yummy. I can’t wait to try it out! Thanks for sharing the recipe. This looks so good! We are trying to add some more variety to our dinners and I will definitely be trying this in the future. I feel like this would be good with chicken as well. These are delicious! I made them and my whole family has requested me to make them again and again! Thanks for a great go to recipe! I’m so glad you tried them and love them! They are fun! Try the other steak bite recipes too, I bet your family will love them as well. Looks delicious!I will be pinning this for future use. Your pictures look great.It shows how much effort and time you put in your post. Thanks Maureen… I do work hard to have nice photos and videos for my viewers. Not to mention great recipes too! Please come back and enjoy more recipes. I must try this. Sounds so yummy! Looks delicious. You really can’t go wrong with honey and balsamic. Hope to make this soon. Looks delicious! I especially like the video; it’s so handy to be able to see how it’s done and read it too. I’ll have to add that to next weeks menu! The Video’s are great to really show how easy it is to make. I’m so glad it’s helpful for you too. Enjoy the Steak Bites. They are delicious. Wow! This recipe looks delicious and I’m definitely going to try making these soon! I love the quality of your photos! Do you mind me asking what camera you use? Do you use natural or artificial light? I love the layout of this post also! I’m definitely going to be saving your blog and put it to use to get ideas for future dinners! Hi Amy! Wow! Thank you for all your compliments. I work hard to keep my site easy to use, with great images and video. My recipes are packed full of flavor using common ingredients. I do all my photography with a Cannon DLSR, and I use a combination of natural lighting and off camera flashes. My video work is done with my iPhone 7+. Let me know what recipes you try! We would love too hear.